I take up my pen to write these words to inform you of a great mystery that has perplexed me for many years. I feel that the answers to this puzzle may be within the grasp of such distinguished fellows as you. To this point answers have been incoherent and entirely inadequate. I have endeavoured to give some account of my strange observation for you. In the winter of 2003 I was walking across Charing cross road and through the grate in the middle an unusual sight crossed my eyes, a sign of a secret street, where did it lead?. 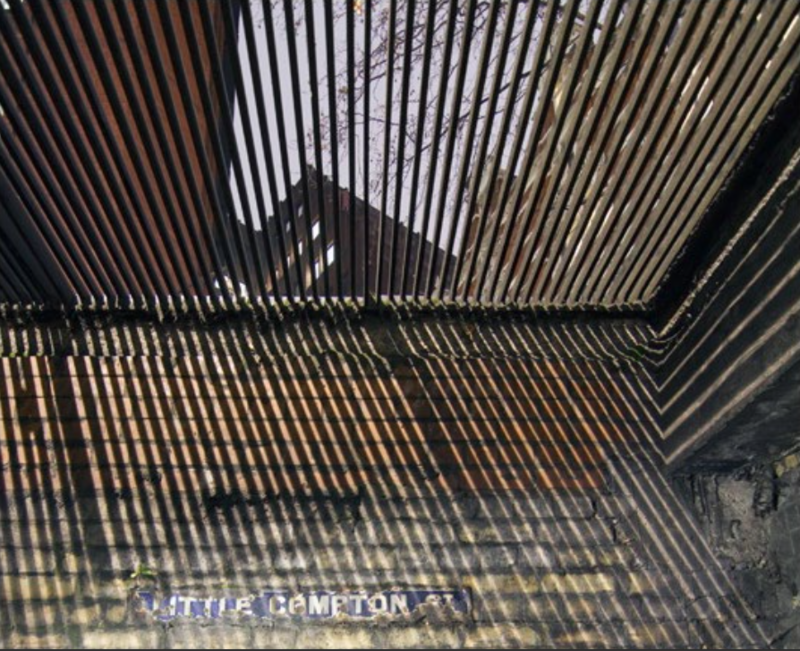 An underground street called little Compton street, first mentioned in the 1700s. But why did it disappear, why is it under charing cross Road. What happened? I ask you to take the utmost discretion when talking of this riddle. We began our work on the case with haste. Popular theories from many blogs and other online resources all suggested that Little Compton Street had been destroyed with the construction of Charing Cross Road in 1877. What was then called Crown Street, was widened, lengthened, and renamed as to become the Charing Cross Road that we know today. But somthing didn’t seem right. Old Compton Street and New Compton street, still exist now in (almost) exactly the same location they did in 1877, but Little Compton Street had disappeared. Had it really been destroyed when the road was widened? Was everything else built up to a higher level leaving the street and its sign buried forever? We began digging into university and museum archives for topographical evidence. And this is where things got interesting. Please compare these two images. Firstly Greenwood’s Map of London from 1827 and secondly Booth’s Poverty Map of 1898-99. 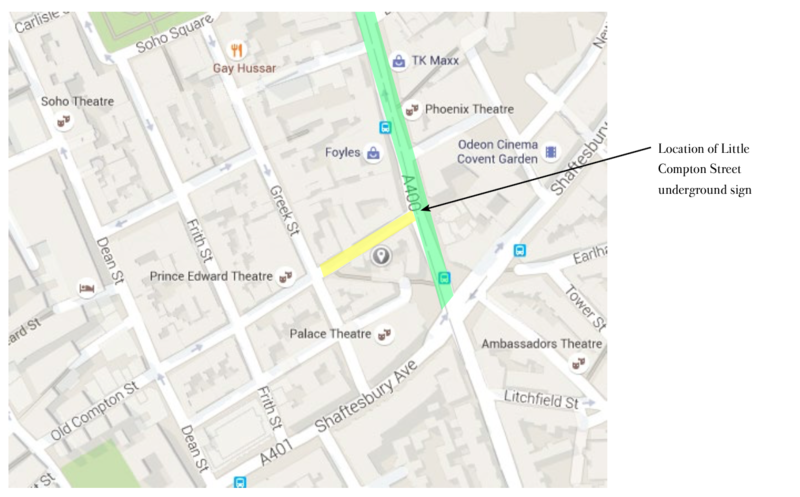 These two maps show this area of London both before and after the construction of Charing Cross Road. 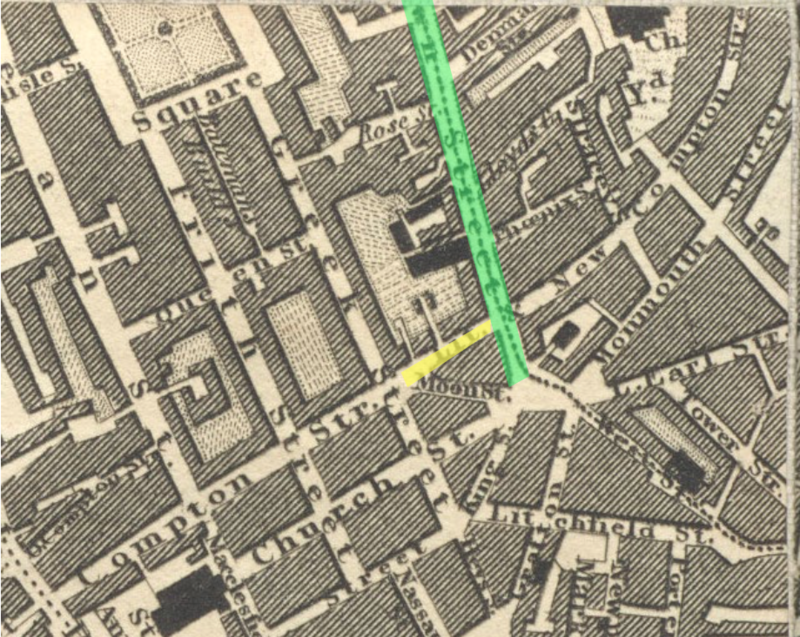 On Greenwood’s map we observed the original Crown Street (shown in green) linking clearly to Little Compton Street (shown in yellow) which connected to both Old and New Compton street. Next we looked at Booth’s Poverty Map, made after the construction of Charing Cross Road and we saw something unexpected. 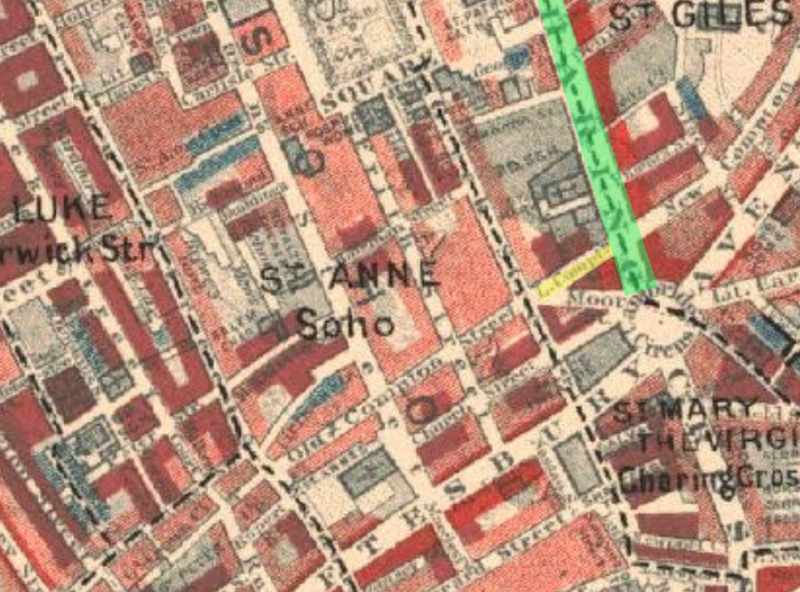 In Booth’s map, Little Compton street was still there (highlighted in yellow again), coming of off the now new Charing Cross Road. This showed that Little Compton Street was not destroyed or buried and disproved the many theories circulating about its disappearance. What Sheppard is saying here is that what was called Little Compton Street, at some point in 1896, was added to the rest of Old Compton Street, and renamed as such. With this we next compared Greenwood’s Map of London with a current view from Google maps. Both areas highlighted in yellow showed the same section of road. The difference now was that what was once Little Compton Street is now called Old Compton street, added to the rest of the longer road. This means, most importantly of all, that Little Compton street was never destroyed, buried or lost, but infact it is still there, where it has always been. It can be walked on to this day. 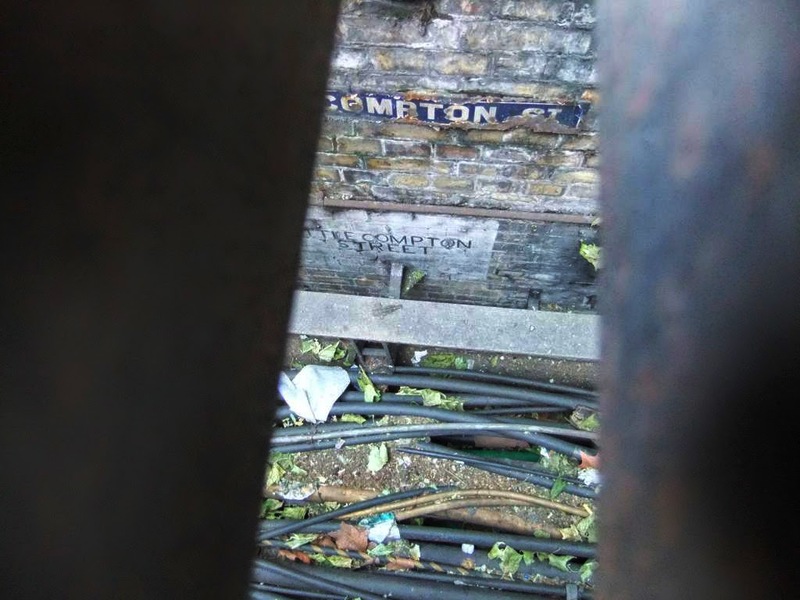 But the question still remained, how did the Little Compton Street sign end up below ground level, and where does this supposedly underground street lead? Here I will refer to our next line of evidence, and to the cultural phenomenon known as Guerrilla Exploring. These explorers enter places that are usually inaccessible to humans but that offer something of excitement or photographic interest. For example an abandoned theme park, a disused floating prison or an ancient mental asylum. And it was these two photographs that held the clinching clue to the Little Compton Street mystery. In these images you can make out two underground handpainted signs, one saying Piccadilly Circus the other saying Oxford Circus. 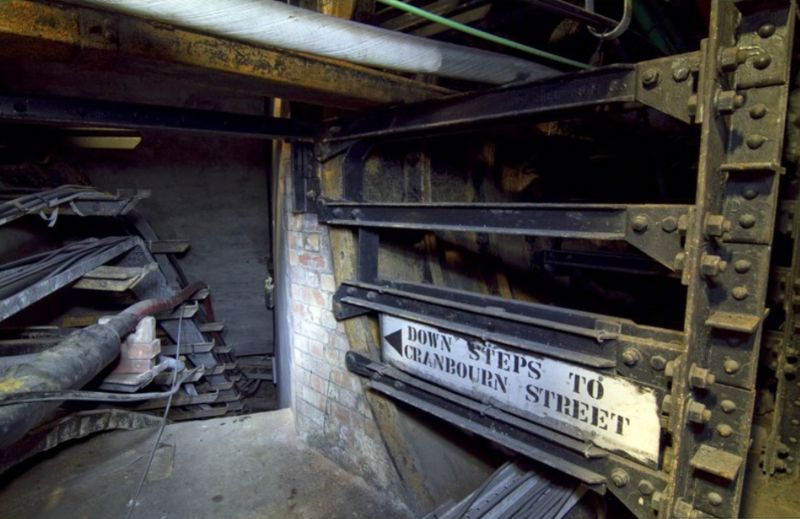 As it is almost impossible to know where you are when walking underground, these ancient signs acted as locators for those working in the tunnels. The solution to the Little Compton Street sign then? That it was simply a sign of location, to help you to know where you are. A location name that has since shifted and vanished with time. However, there was still something else to figure out. As we noticed, these black and white underground signs in the tunnels looked so different to the Little Compton Street sign itself. They presented as much more functional, stencilled lettering completed quickly for the purpose that it wouldn’t see the light of day. Where as the Little Compton Street sign looked much more like a ground level street sign. So the final theory on this? Perhaps it was a past preserver, a worker or even a passerby, at the time when Little Compton Street was renamed. Not wanting the original street sign to be lost or simply thinking that is was useful, placed it underground crudely and quickly stuck up with some wet cement. But is that exactly what happened? Unless new evidence comes to light, I guess we will never know. 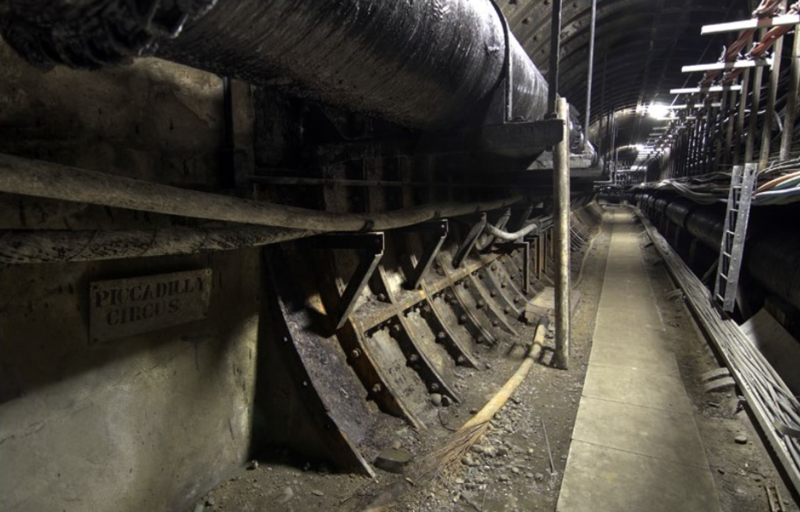 So, an underground network of tunnels, a preserved piece of London signage, and a disappearing street that never disappeared at all. We presented these findings to our illustrious client and this was his response.